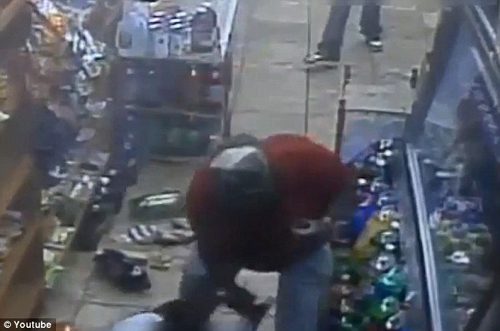 Over the weekend, an amateur rap video being filmed in a Bronx, NY, convenience store got real in a hurry with one of the men involved shooting his “best friend” five times, before pistol whipping his crumpled body. According to shop attendant Ali Abdul, the men were intoxicated and began arguing about who the better rapper was. Spit began to fly, and then came the bullets. After the shooting and whipping – which was captured on video – a number of men seemingly associated with the shooter and perhaps the victim, can be seen walking past the victim’s body as it twitches upon the floor. One guy even pulls out his phone as he attempts to step around. Fortunately, paramedics soon arrived on the scene and the unidentified victim was taken to hospital. He remains in critical condition. Thus far, the shooter has yet to be apprehended. The video of this footage is rather graphic, thus we’ve opted not to share it here. Next: Fan Pics: Gogol Bordello in London, ON.